Hello, I love Japanese style cooking. I think to know the cuisine is like knowing the country's culture intensely; that's why started holding cooking classes. I am really looking forward to meet you and enjoy cooking together! We had an amazing time learning so much about the Japanese cuisine. If you are looking for a lesson on sushi making and wanting to learn traditional history than look no further! I would do it again! Kaori was wonderful! In the space of a 3 hour lesson she introduced us skillfully to ideas about Japanese food, seasonality, and health in a historical context. 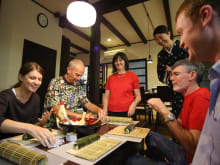 We were then introduced to ingredients, preparation techniques and cooking, culminating in an excellent Japanese meal which we enjoyed with green tea and sake. Handouts with recipes and tips will allow you to reproduce this striking dinner at home. Unlike other culturally important lessons that we had with other providers in Wagashi (Japanese sweet-making) and Tea Ceremony , Kaori's instruction will be reproducible at home and is therefore both practical and long-lasting. Thoroughly recommended! Such an interesting experience to learn a new skill-making real Japanese sushi. My son and I had fun making our masterpieces. I was in awe when we finished plating our meal. It was beautiful! And to top it off it also tasted like the real deal. Thank you Kaori for your help and patience. Rest assured that we will be doing your recipes back home. As a matter of fact I already bought some kelp and bonita to bring home!